Heist movies are a favorite of mine. I always love to watch a variety of characters interact, formulate, then execute a plan that usually screws over the bad guy who deserves it. Afterwards, our heroes sail off into the sunset to enjoy their rewards. I guess that is why I was always such a fan of the A-Team. I do love it when a plan comes together especially one that I coordinate. Yesterday helped fulfill that for me. It was one of those days where I needed it all to go as planned because yesterday was the day I planned to pop the question to Kim. Kim and I have been talking for some time about getting hitched. It’s been pretty much inevitable. We have known, early on, that we are made for each other. Sometime around the start of the new school year, I began to work on some possible ideas. My roommate, Dan, and I came up with the plan while eating out one night. My little sis, Mary, started e-mailing some ideas and Operation-Get-Kim-To-Say-Yes was hatched. My Mom, Dave Westbrook, Steve Freenor, Kristin Wilson, the good People at Bass Pro Shop, WSAV3, and FOX 28 also got on board to. The biggest confidant came from Veronica, Kim’s 11 year old daughter. My A-Team was formed. It all came together December 21, 2011. 11:30am We arrived at Savannah Mall under the pretense of doing some last minute shopping and have a family picture with Santa at 1pm. I dropped Kim and Jude off. The plan is to meet us back at Bass Pro at 12:45. Jude was given explicit instruction to keep his Mom busy while Ronnie helped me finish my Xmas shopping for Kim. 11:45am Mom and Mary show up at Bass Pro. Mom had the ring gift wrapped in red which is Kim’s favorite color. Mary was supposed to bring my camera and favorite hat. It was the one I bought with Jude to wear on our first vacation together in St. Augustine. Kim loves that hat and I wanted to wear it while proposing. In their rush to meet us on time, Mary forgot both. I had a momentary freak out but regained composure. Sorry again, Mary. 11:55am My stomach begins to get that loopy feeling because I knew I’d hit that point of no return as I handed off the ring to the Store Manager of Santa’s Village and we went over the plans of how things would go. More jokes about Kim saying Yes occurred. Geesh!! 12:00am My hair kept falling in my eyes and I really hated not having one of my newsboys hats. Mary, Mom, Ronnie, and I make a run to Target to get another. 12:05am WSAV called to set up final details for filming the event. They wanted to meet out front which I thought ruined that whole surprise element I was going for. We worked it out as I rummaged through hats. Ronnie picked out one that made me like Elmer Fudd. I began to grin because I realized an 11 year-old had gotten the better of me. 12:10am Mary had assumed role of keeping me focused. Apparently, I can get distracted by shiny objects. Mary began to work me towards to the door. I realized I need to have some gifts because that was the main reason we separated. Ronnie and I began to shop for Kim’s stocking stuffers. 12:15am I headed out the door with new hat on head and hair not in my face. Dave Westbrook called because he wanted to watch the event. I told him to hit us up in front of Bass Pro which was where I was headed for Kim. 12:20am Ronnie asked how I going to ask Kim and I realized it was the one thing I hadn’t forgotten to figure that one out. I knew there was a good chance I’d get choked up so I decided to go with simple. 12:30am Dave Westbrook showed up. He’s brought his recorder. Dave is one of the most talented musical people I’ve ever met but he loves to play his varying set of recorders. I hate recorders because of a crazed Uncle and Medieval Music Camp that Young Harris College hosted every summer while I grew up. He plays it wonderfully but I suspect he also loves to bring it out to aggravate me. 12:45am Jude and Kim arrived. We began to go in and I realized I couldn’t swallow. I had to buy a bottle of Bass Pro brand water. I kept thinking of that scene in Jaws where Richard Dreyfus is about to be lowered in the shark cage and can’t make any spit for his goggles. ‘Why am I so damn nervous? It’s all working out,” goes through head on a loop. I squeeze her hand again. 1:00pm Moment of Truth. 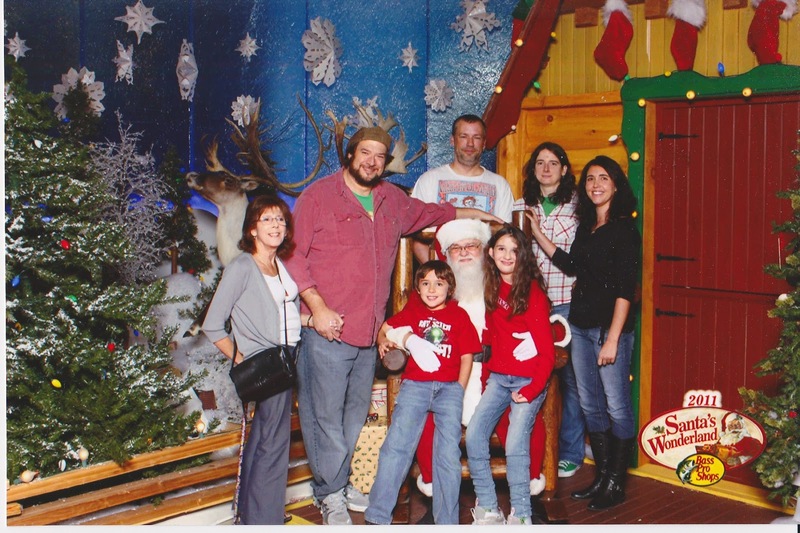 The whole gang huddled around Santa and we took the best family photo ever. My mom has never looked more happy and beautiful. Kim is so happy and had no idea what is about to go down. The kids were perfect. Mary was beaming and Dave relented on the recorder. Yesssss! 1:03pm Everyone began to disburse when Mrs. Claus walked up to Kim, She said perfectly, “Kim, I have something for you.” She handed Kim the box. Kim looked at me smiling nervous because she knew something was up. 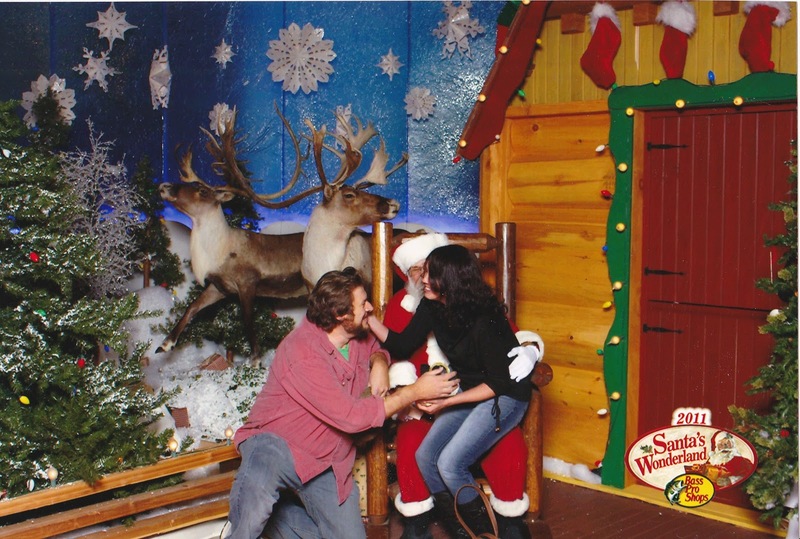 Santa said, ”Come here and sit on my knee while you open it.” Kim walked over hesitantly and I stated my descent to one knee. What happened next is a blur to me. It’s all very fuzzy muddled with a lot of joy and happiness. I kind of remembered her opening the box. I know I asked her to marry me without messing up. Somehow, I even thought of taking off my hat out of decorum. I also know, for a fact, that she said yes because my next clear memory is her smiling at me while holding face and kissing me. 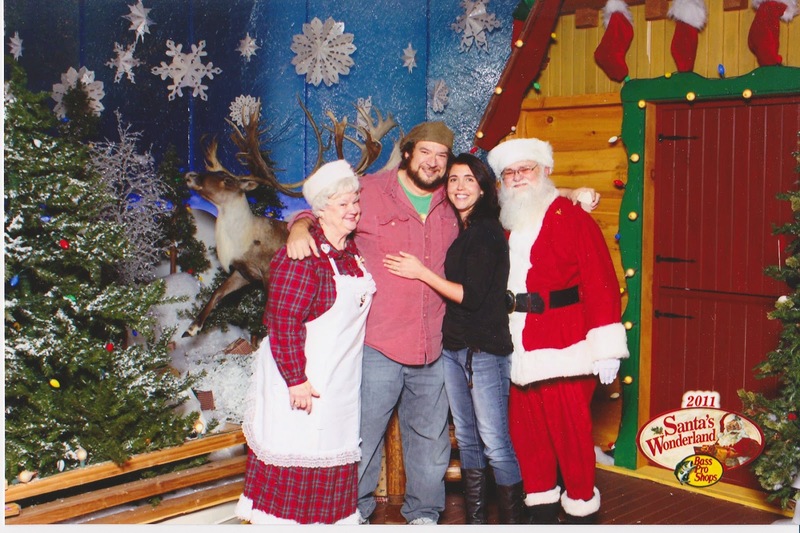 A small cheer erupted in Bass Pro and according to Kim, everyone was crying, including Santa and Mrs. Claus. I had that perfect moment that I always like to talk about. This time it occurred with my family, old, new, and adopted. I started this blog about a year ago to work on my storytelling skills. Along the way, Kim, Ronnie, and Jude entered my life and filled in all the empty pieces that I had. The more I wrote, the more I realized how much better my life was by the addition of the three of them. Yesterday, I got the greatest Christmas gift I could ever ask for. As much as I covet my Star Wars Death Star Playset that I got back in 1978, I have to admit that getting a fiancée and two awesome step-kids definitely trumps anything George Lucas or Kenner could ever come up with. I am a lucky man. I know everyone does the obligatory Merry Christmas and blessed holidays stuff this time of the year. It’s probably a bit trite by now. Please realize that as I type this from my un-Grinched heart, I mean every word. Merry Christmas! Go tell someone you love them and hold ‘em close. I couldn't be happier for you both. I love you guys so much and hate I missed it! Somebody told me that I was there in spirit or that my spirit was there, something like that. Let me know what you guys need, babysitting services for the honeymoon, inappropriate clothing, awkward dance moves, I'm your gal! Just sayin'.